In life, there are times when we are faced with arranging a fitting tribute that honours a loved one, and helps us say farewell. At times like these, you need guidance and support from someone you can trust. For over 45 years, Strathie's Funeral Homes have provided families with dignified, thoughtful, personalized, and compassionate services. As a family-owned and operated funeral home, we understand that our customers are really our neighbours. At Strathie's Funeral Home we are dedicated to being there in your time of need with two locations. We take every opportunity to create the kind or personal relationships that allow us to provide the individualized compassionate service your family deserves. have provided families with dignified, thoughtful, personalized, and compassionate services. Are you looking to add a personal touch to your loved one's funeral service? Maybe you want to learn more about planning your own funeral. We can provide all of this information — and more — for you to explore with one of our caring representatives. Our experience has taught us that when losing a loved one, those left behind feel lost and alone. Many do not know where to turn to or how to cope. Our support is dedicated to helping you during your difficult time and making each day a little easier for you when a loved one is lost. 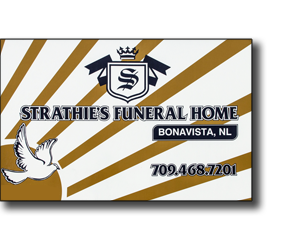 Copyright © 2014 Strathie's Funeral Homes. All Rights Reserved.